---The Beta period has concluded for the Fractured America Map. All objections have had their time. The Foundry and I hereby brand this map with the Foundry Brand. Let it be known that this map is now ready to be released into live play. Just wanted to say congrats Isaiah on being removed from BETA. Great map, already finished up a fun tourney on the map. Also a very big thank you to everyone who helped out, to make this map possible!! Congrats - I really like this map! Good job. It's a good quads map I think is its biggest strength. Yep, it turned out pretty damn nice. and your welcomed. Great map! It's my favorite! I can't remember if it was discussed during development... I was a noob to the foundry back then. But I would guess those mountains were added for gameplay reasons... 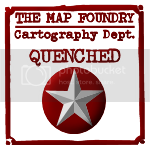 I guess some other kind of impassable could be used, but since the map is already quenched, it's up to the mapmaker whether he wants to make that change. Yes mountains are there for gameplay reasons, and I won't be doing any changes any time soon. I noticed that Abraham Lincoln is quoted on the map (A house divided against itself cannot stand). As he is not the originator, would it have been more apt to quote the original source, i.e. the Bible? (Luke 11:17) Just a thought. Though that is a true statement, it wouldn't go with the theme too well IMHO. neanderpaul14 wrote: Looks awesome man, but I was wondering shouldn't there be a Mormon bonus region centered around Utah??? ?.....I mean this would be a highly feasible region in what you are describing. Well, it is called "Deseret." When that whole area was one state that was the first name the Mormons had gone with to the US government, when they were applying for statehood. Love this map, though the least libertarian party of the country being named Libertarians is a little weird. Alraun wrote: Love this map, though the least libertarian party of the country being named Libertarians is a little weird. Alternative and theoretical futures are always a little fantastical.